Dame Vera Margaret Lynn, widely known as "the Forces' Sweetheart," is an English singer of traditional pop, a songwriter, and an actress, whose musical recordings and performances were enormously popular during the Second World War. The songs most associated with her are "We'll Meet Again", "The White Cliffs of Dover", "A Nightingale Sang in Berkeley Square" and "There'll Always Be an England." In 2009, at age 92, she became the oldest living artist to top the UK Albums Chart, with "We'll Meet Again: The Very Best of Vera Lynn." 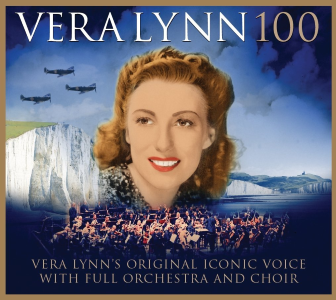 This year, she released the album, "Vera Lynn 100," to commemorate her centennial year. It was a number 3 hit making her the oldest recording artist in the world and the first centenarian performer ever to have an album in the charts. She has devoted much time and energy to charity work connected with ex-servicemen, disabled children, and breast cancer. In 2000, she was named the Briton who best exemplified the spirit of the 20th century.